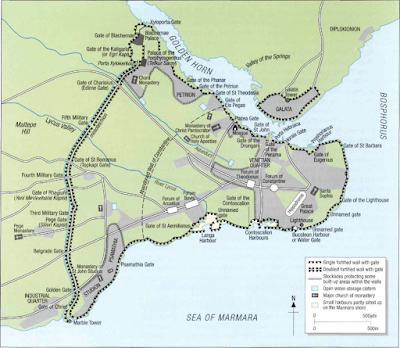 Constantinople: evolution of an imperial capital. 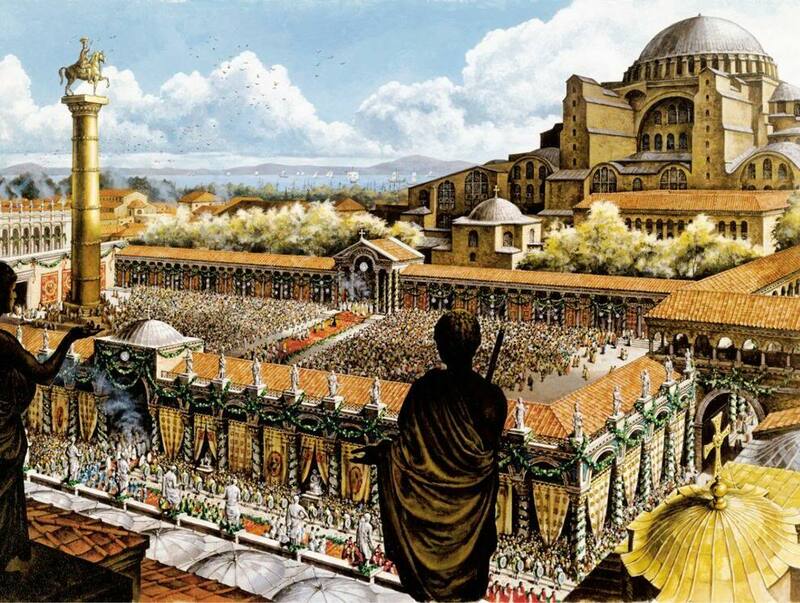 The establishment by the Emperor Constantine I on the site of the ancient city of Byzantion of a new imperial capital in the year 324, and its formal consecration in 330, had far-reaching consequences for the pattern of exchange and movement of goods in the Aegean and east Mediterranean basin, as well as for the politics of the late Roman world. With the imperial court, a senate, and all the social, economic and administrative consequences of a major city, Constantinople soon grew to be the dominant city of the eastern Mediterranean region, rivalling Alexandria and Antioch in wealth, prestige, population and cultural influence. 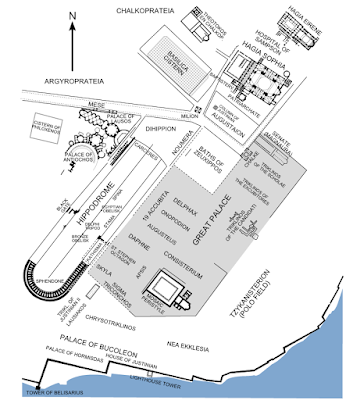 But the foundation of the new capital was not the radical break with tradition it is sometimes suggested: Diocletian had some years previously established his own residence and court at Nicomedia, not far to the south; while the establishment of regional locations for the emperors was a reflection of the needs of the tetrarchy. Constantine’s choice was probably based on strategic considerations, since his new capital was located where two major land routes met, both of strategic value: the via Egnatia, which crossed via Thessalonica to the Adriatic coast, and the military road from Chalcedon, opposite Constantinople, via Nicomedia to the east. That the founder of the new imperial city envisaged a substantial population is evident from the fact of his arranging an annual grain supply from Egypt amounting to some 80,000 rations. Rapid growth certainly followed, with greatly expanded water-supply and accompanying structures (aqueducts, cisterns and so forth), grain-storage facilities, and residential areas. The pipes, channels and aqueducts bringing the city’s water reached over 80 miles out into the Thracian hinterland, and have still not been fully traced. The imperial headquarters was established with the construction of a palace complex, placed in the south-eastern corner of the original city, accompanied by a substantial hippodrome and a new city wall encompassing an expanded urban area. The major thoroughfare began at the palace in a colonnaded route constructed under the Emperor Septimius Severus (who rebuilt parts of the city after the destruction which occurred in the civil war of 195–196) and led through the circular Forum of Constantine across the city to the Golden Gate, a triumphal entry to the city in the southern section of Constantine’s new land wall. Successive emperors then embellished the city with their own monuments, including, for example, stoas, colonnaded streets, baths and other public amenities. In the period from the fourth to the seventh centuries some 40 public bath-houses were built, supplied by a series of vast cisterns, mostly open air constructions. The cistern of Aetius was among the largest and could hold some 160,000 m3 of water. By the same token the number of imperial and private mansions increased, so that by the early fifth century there were at least five imperial palaces of varying size and function, while the great palace itself continued to be added to and grew into an immensely complex labyrinth of buildings. In later years the city was famed for its churches, although it seems that Constantine built only three (St Irene, which functioned as the city’s cathedral church, and the two churches dedicated to local saints, of St Acacius and St Mocius). But by the 420s there were some 14 churches, and the numbers increased in the following century. Just as they added to the secular ornamentation of the city, later emperors added to this number, and the most famous was built by Justinian in the mid-sixth century, the church of the Holy Wisdom, or Hagia Sophia (on the site of an earlier church of the same name destroyed in rioting). The defensive walls destroyed by Septimius Severus were rebuilt during the later third century. Constantine began a new circuit further to the west enclosing an area twice as big again as the original city. Completed under his successor Constantius II, the absence of any substantial threat from the sea meant that no sea defences were constructed. The Gothic threat in the 370s and afterwards, the increasing exposure of the city to raids from beyond Thrace, and the rapid expansion of the city population and the needs of the imperial government changed this situation, and during the reign of Theodosius II the prefect Anthemius enclosed more land within the city and built the land walls which can be seen today, a massive three-level system with a moat, stretching for some 6 km from the Sea of Marmara to the Golden Horn. While the land-walls were begun in 412– 413, the seaward defences were not begun until the late 430s, but proved their worth in subsequent centuries. The rapid expansion of Constantinople ground to a halt in the period from the mid-seventh to late eighth century as the empire lived through its centuries of crisis. But from the early ninth century on it began once more to expand both in terms of population and in respect of building activity. In the 530s the total population may have been as many as 500,000 (some estimates are even higher); by the middle of the eighth century, following a major plague in the 540s and endemic pestilence throughout the period up to the 750s, culminating in another major plague in the later 740s, the population may have been reduced to a low of as few as 30,000–40,000 (although all these figures are contentious). Thereafter it gradually rose again, until in the later eleventh and twelfth centuries it may have reached the levels of the early sixth century. The city saw several sieges – successful resistance to the Avaro-Slav siege of 626, the Arab sieges of 674–678 and 717–718, the Bulgar attacks of the early tenth century and attacks from Russian sea-raiders in the tenth and eleventh centuries proved the effectiveness of its defences. In 1204 the city fell by treachery to the forces of the Fourth Crusade, ostensibly en route to attack Islamic Egypt; and the sack that followed witnessed the removal or destruction of great numbers of monuments, as well as the burning of buildings and other forms of destruction which accompany such events. Recovered by the Byzantines in 1261, it remained in imperial hands as the empire shrank to the city and its immediate hinterland in the later fourteenth and fifteenth centuries, to fall in May 1453 to the Ottoman army under Mehmet II after a siege of over two months. Styles and fashion in building affected Constantinople as they affected any other built environment, and given the length of the city’s imperial history it is not surprising that a number of shifts can be seen in this respect. Most obviously, the secular aspect of imperial building diminished as emperors and members of the imperial family and court invested their wealth in churches, palaces and philanthropic establishments, many supported by generous endowments in land and property. Basil I is supposed to have rebuilt or restored over 30 churches in the period 867–886. During the eleventh and twelfth centuries many members of the imperial élite donated funds for the construction of monasteries or philanthropic establishments in the city, some of them vast, such as the great Orphanage of St Paul built and endowed by the emperors and reportedly requiring a whole day to inspect. But as well as such buildings the city also contained residential quarters, mansions for the wealthy, a vast range of trades and crafts and the accommodation required to produce and sell their wares, covered and open-air marketplaces, as well as imperial armaments workshops, docks and harbours for both military and civil purposes. 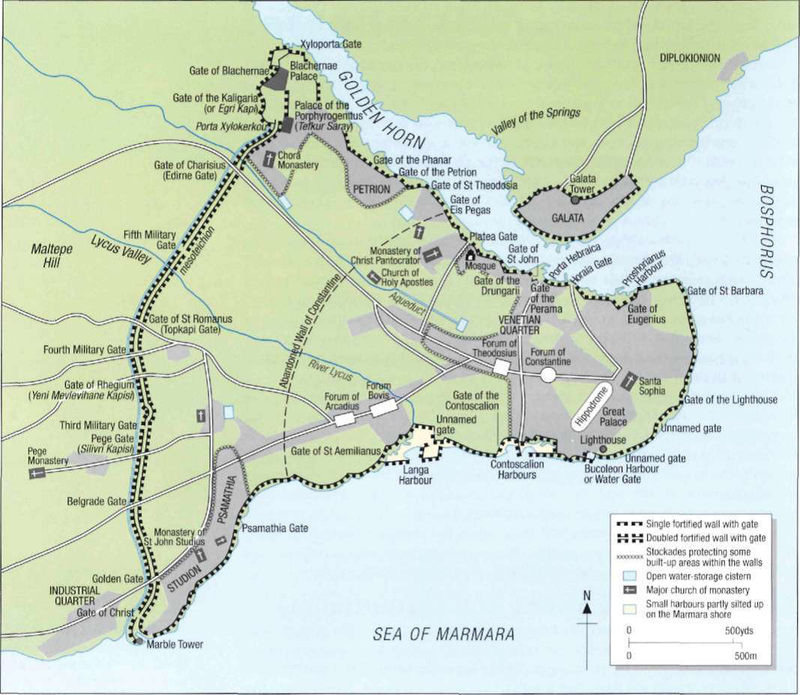 From its nadir in the eighth century, when only one commercial harbour seems to have functioned, in the twelfth century the city could boast some four harbours and a larger number of quays along the shores of the Golden Horn for the various merchant communities who had commercial rights in the city, and in its later years was credited with 365 churches, an exaggeration, certainly, but indicative of its image and reputation. The city was the site of imperial ceremonial events throughout the year, and many were staged as city-wide events. The prefect of the city had the authority to order individual households along any ceremonial route to contribute by hanging out precious fabrics and tapestries, for example, and the streets would be perfumed and decorated to honour the emperors. Ceremonial processions were generally of a religious character and marked key festivals of the church; but military parades, triumphs and the processing of captives and booty were also common. There were several favoured routes, but the most important was that which led to or from the imperial palace and the church of the Holy Wisdom, along the Mese or a parallel major street, to the Golden Gate.